We've had a number of snowman themed books arrive in at the library, just in time for all of our snow to melt. After a rainy, drippy, gray kind of day, G helped me put together a frozen snack tonight, to put us back into a snowman kind of mood. We weren't really sure what we were doing, but we had a general idea of where we wanted to end up - with frozen, chocolate covered bananas, shaped like snowmen. First we gathered our supplies. 2 bananas (ours were pretty yellow, but generally closer to the green end is better for frozen bananas). 6 wooden skewers - we broke the pointy parts off to make them safer for little mouths. We also prepared a cookie sheet, covered with tinfoil, and we were ready to start. We sliced the bananas, and placed three slices onto each skewer, as shown. We melted the chocolate chips, in a wide, shallow bowl, in the microwave, running it for 60 seconds, stirring at 30 second intervals, until it was smooth, and completely melted. We dipped the banana skewers into the chocolate. This is the part where we really didn't know what we were doing, so it was a little tricky, trying to cover the bananas, while keeping them on the skewer. We finally, ended up spooning the chocolate over them. Then, we placed them on the tinfoil covered cookie sheet, and quickly decorated them with the mini M&M's, and chocolate chips, before sticking them into the freezer, for a half an hour or so, to harden. ...it didn't matter. 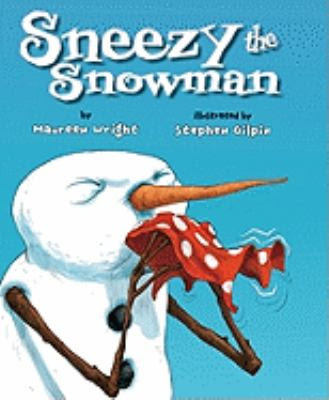 Sneezy the Snowman, by Maureen Wright, is a story about a snowman trying to find the right temperature, and melting himself, several times along the way. The children rebuild him each time, and offer him a hat, a scarf, and a coat, to help him feel cozy, but not too warm. In the end, it's a combination of the children's help, and a frozen treat, that make him feel just right. It's sort of a strange story, but with a repetitive refrain, good for emerging readers to join in. And, it fit with our snack, and our mood, of not being sure if we're too cold, or too hot, or too springy, or too wintry - just right, as well. To keep the choco from looking melted you freeze the banana slices first, then dip them in the chocolate and the chocolate freezes instantly on the bananas! :D I love the idea of snowman bananas, might have to try that, even if it's summer in our hemisphere! We have made banana snowmen, but I never thought of covering them in white chocolate and freezing them - great idea! We haven't read that book yet. It looks cute. Kendra - Good to know! That looks yummy. Only problem is I'm not a big white chocolate fan. Ticia - LOL, I can totally see you making mudmen - they would fit better with the Texas weather anyway, would they? Interesting tip about freezing bananas first - great snack to come with this book. I am also not a big white chocolate fan. I was thinking the same thing as Kendra said about freezing the banana slices first. These are cute and I bet tasted yummy. I just recently stumbled upon your blog, and when I saw these adorable little snowmen I had to try them with my kids. We made them tonight and froze them before hand. They came out so cute and awesome. If I get a chance I'll post them on my blog and send the link. Thanks for all of your wonderful ideas! I know your site is one I will be returning to again and again and again!